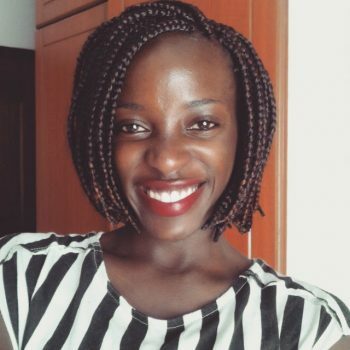 Magdalyne Kanjejo drew her passion and commitment for civic engagement after volunteering and holding leadership roles through the global youth organization AIESEC. While in the organization, she managed and worked with several schools within slums around Nairobi and it is in this process that she became drawn towards advocating for inclusive and equitable quality education for children from underprivileged backgrounds. This is what led her to be part of the leadership team of a community-based organization known as Mabawa Mathare, located in Kenya’s second largest slum, Mathare, which aimed at enhancing education for primary school students through creating opportunities for them to further their education. Although she is no longer a part of the organization, she describes the experience as life changing and a real foundation for her career in the social sector. Prior to Mabawa Mathare, Magdalyne worked as a Managing Editor for an entertainment news site. However as her interests took a turn, she quit her job and moved to Oslo, Norway, to work as a communications volunteer with Amnesty International’s Human Rights Education Centre. She is an Amani Fellow, a Young African Leadership Initiative, RLC, East Africa fellow, and currently runs a program known as Alive Movement, which is an initiative that aims to mentor primary school students within Mathare slums to be confident leaders who are aware of their rights and are using their skills to transform their community.